Before I start this review, 9 out of 10 times I don't touch repaints. It's just not something I like in my collection. 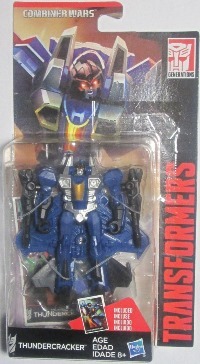 However to every rule there is an exception, and in this case it's Thundercracker, and with any luck Skywrap. This is a repaint (sans bug bot) of the Starscream legend figure. I did a full review of him last year. In some ways Thundercracker got the short end of the power stick so to speak. Since all the Seekers are the first repaints made in Transformers and it happened on day #1. Roll Call on names and powers! Skywarp: He can teleport, and he has bouncer bombs! Thundercracker: He makes sonic booms. A weapon that isn't a weapon as Mythbusters proved. Guess he'll need a new weapon one day. Maybe we can say he can hit stuff at mach speeds, and not feel the pain? For the most part Thundercracker fell into the category of perfect Decepticon for Megatron. He followed his orders, and he didn't think much. He could've been more of a character in the cartoon series if some unknown force had given him more lines. I mean most of the time he was kissing Megatron's rear skid plates as he defended Megatron's latest plan. Only once or twice did he show some ambition, and admitting he hated Starscream, which is why he tried to cast him in a bad light. Hell for all we know he was a Seeker to act as a break to Starscream's treachery, but that would've required more plot than we were used to in the 80s. Given the potential we saw out of him, it makes sense why Starscream wasn't too reluctant to give him a bonne voyage when it came time to unload some deadweight from Astrotrain in Transformers: The Movie. Since Soundwave wasn't in too bad shape from the battle of Autobot City, it seems like Thundercracker was the next best thing to removing Megatron loyalists from the ranks of the Decepiticons. Depending which source you believe he'd spend the rest of his days being shot up by Galvatron. Makes you wonder what would've happened if he hadn't had such a bad history with Starscream. The official Hasbro Combiner Wars biography of Thundercracker reads as follows, "Smashes targets from long range with a pulverizing sonic boom." Man that was short, and just in case anyone asks he doesn't have any stats. Seems none of the Combiner Wars Transformers have any. I am noting my official disappointment in Hasbro here, not just for how short the bio is. Mythbusters proved this wasn't a viable weapon in 2009. Common Hasbro, time to play nice, and give him a new power. Let's tear old Thundercracker apart. When it comes to articulation, and strength's he's ounce for ounce as tough and as good as Starscream. His hands can hold any weapon as long as it has a 5 MM peg . I've loaded him up with Generations Jetfire's gun fully loaded. Looks ridicules given how the gun is larger than he is tall, and wider than he is, but more power to him. When it comes to articulation, and what can Thundercracker do. Well believe it or not, Hasbro fixed a problem or two in between Starscream and him being made. 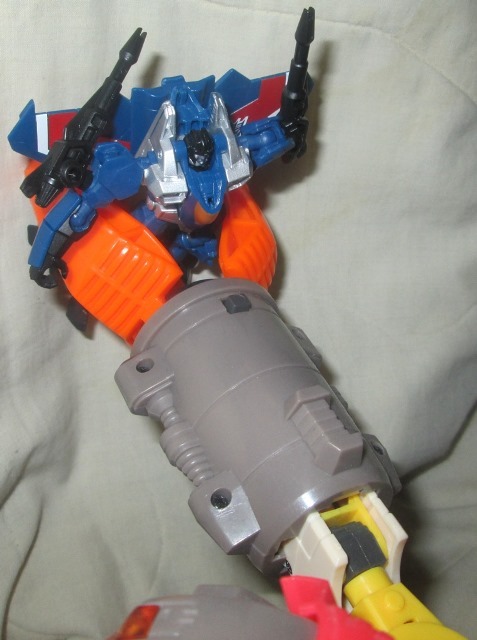 Yes Thundercracker has loads of ball joints in him, yes his knees still bend the same. However his ball joints seem tigher than Starscream, which is great for everyone involved since I popped the arms off my Starscream a few times while transforming him. Transforming him can be done in 8 easy steps according to the box. Actually that is a feature all the legend sized figures are boasting X easy steps to go from robot to X. I pull the arms down, I flip his wings down towards his feet that I closed up, and then locked together. We're already on step 3. Extend his nose now, attach the guns to his arms, and hey we're done! Maybe I count different than Hasbro? Then again maybe I skipped a step or two. 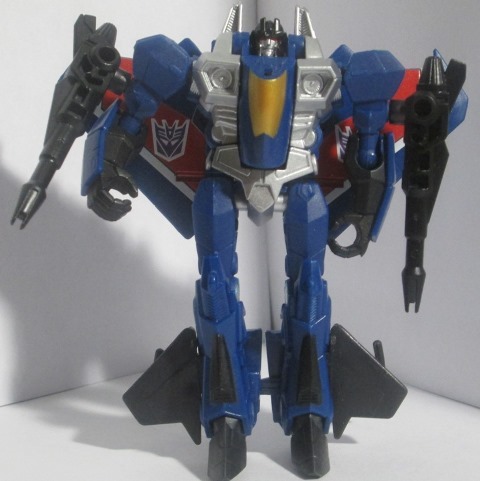 Thundercracker like Starescream before him transformers into a hybrid F-15/F-22. A jet that doesn't have any real world counterpart. Guess old Teletran 1 wasn't working at full power when this happened. That or the Decepiticons are hoping that given how they're a made up jet everyone will assume they're with someone else. I mean common it happens in the real world, why not the fictional one. He is a passable jet, but with the silver paint job, a problem I didn't notice on Starscream becomes more apparent to the naked eye. The back part of chest sticks out a bit when he is transformed. I even did a double check with Starscream, same flaw. It's minor, but still worthy of a heads up. He does retain a 5 MM hole midway between his cockpit, and engines, so a mini-transformer, or a weapon can plug into there and be fired way. Now I have images of his Transformers Cybertron counterpart who had a Texas accent and was a bit gun happy. 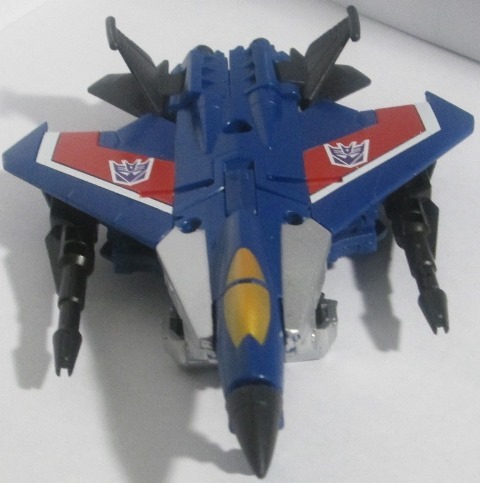 For the most part I loved Starscream as a hybrid F-15/F-22, I love Thundercracker as one, maybe even a bit more since Thundercracker has more pop to him. I give Hasbro it's dues for trying to really make him look like a total jet even with his small wheels built into his knee caps. Transformation Design 5/10: I know it's a tradation that almost all Seekers have the same mold, and I am being rotten by giving it a 5 on 10. However the fact is he is a repaint, and they could've changed things in the design to reflect the new line. Durability 10/10: I put Thundercracker though toy torture, heck if it was Toy Story, he'd be wondering how he survived. He did a nose first 6'1 drop (which is 14.6X him) more than enough space to grab some speed. Nothing broke off. He did a straight drop, in robot mode. Same results. No weapons went flying off, no body parts. Thundercracker, we salute you in durability! Fun 8/10: He's a jet, he's a robot, he has two guns! Yup, he's loads of fun. Not as good as a video game system on a long road trip, but definitely fun enough to keep a kid happy for a few hours as s/he plays the hours away as Thundercracker servers Megatron and tries to destroy the Autobots as he stabs Starscream in the back. Aesthetics 9.5/10: Whoops 0.5 below a perfect 10. I love the paint job, I love the overall feel of him. However the hole in the back. Yeah that costs him half a point. He definitely looks great! Heck he looks too good for a character with such weak powers. Articulation 8/10: Thundercracker brings nothing special to the table articulation wise. Value 10/10: I am giving Thundercracker full value marks for a few reasons. The first being I got him at Target's going out of business sale. The second he survived toy torture, like Woody from Toy Story would be g going, "You alright there Thundercracker?" as he winces. This is a great little toy for the kids in the back of the car, or for a collection who has Starscream. Overall 8.4/10: Holly Smokes! He comes in 0.9 higher than Starscream. I wish I could say it was mercy on part, but it's not, it's the fact that he looks better than old Starscream, and was cheaper than him in the end. Now common Hasbro, play nice and give me Skywarp!